Reading in Chicago 5/1/12: The Wit Rabbit Reading Series Countdown Begins! I’m headed to Minnesota this June to help Bridget Beck celebrate the launch of her newest interactive sculpture, “Poetry Studio.” As part of the 2-day extravaganza, I’ll facilitate two community poetry workshops and read from my current project, American (post), with Heid E. Erdrich, Dobby Gibson, and Wang Ping. The official press release from Franconia Sculpture Park follows, and I hope to see all you Minnesotans and intrepid travelers there! Franconia Sculpture Park celebrates Bridget Beck’s new large-scale sculpture with poetry workshops, readings by Heid E. Erdrich, Dobby Gibson, Wang Ping, and Ashley David, and performances by Cromulent Shakespeare Company and Thea Ennen. Every poet needs a brightly colored multi-ton poetry studio sculpture to write in—at least Bridget Beck thinks so. Bridget, with help from some very talented poets and you, debuts her newest interactive sculpture at Franconia Sculpture Park on June 22nd from 2 to 4 p.m. and June 23rd from 1 to 5 p.m. Bridget’s interactive studio sculpture comes with a bench swing, elevated writing studio, umbrella roof system, winding staircase, and escape hatch. The visiting public—the young and the young-at-heart—can participate by creating poetry during workshops held both days. Selected participants will read their poems alongside established poets, Heid E. Erdrich, MN; Wang Ping, MN; Dobby Gibson, MN; and Ashley David, GA & VT.
Poets have long been inspired by various forms of art, and these workshops invite you to interact with sculpture in new ways. Poems will grow out of sculpture and the surrounding environment, and, in turn, the sculpture and environment will grow with the poems they inspire. In these hands-on workshops, you will use colorful origami paper, magnets, your imagination, and a sense of play to make your poems. Poet, Ashley David, will facilitate the writing workshops. The poems will become part of Bridget Beck’s sculpture, “Poetry Studio.” Selected poems will be read to the audience on both workshop days. In addition, during the Saturday poetry workshop, poet Wang Ping will join us with the Kinship of Rivers project. Kinship of Rivers is a joint project between communities along the Mississippi River and the Yangtze River in China. Gifts such as art and poetry are created and exchanged between the two river communities and installed along the length of each river. Wang Ping will work with participants to create colorful river flags to be installed along the Yangtze. 2–4 p.m., poetry writing workshop and readings—local youth are encouraged to participate; reserve a spot by contacting info@franconia.org or calling 651-257-6668. Free event. 1–3 p.m., poetry writing workshop—the community is encouraged to participate; reserve a spot by contacting info@franconia.org or calling 651-257-6668. 5-9 p.m., Cromulent Shakespeare Company and Thea Ennen perform in the Franconia Earthen Amphitheater. Free event. Participating poets include Heid E. Erdrich, Wang Ping, Dobby Gibson and Ashley David. Heid E. Erdrich is the author of four poetry collections, most recently Cell Traffic: New and Selected Poems from University of Arizona Press. Wang Ping is a Chinese-American author and academic whose writings center on the past and present of China and the experiences of Chinese immigrants in America. Dobby Gibson is a poet and author of the collections Skirmish (2009) and Polar (2005). Ashley David is a poet, PhD candidate at The University of Georgia, and a 2011-2012 pre-doctoral resident-artist fellow at the Vermont Studio Center in Johnson, Vermont. 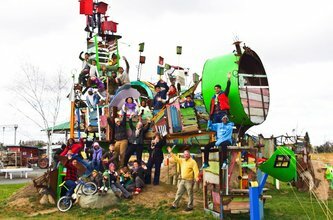 Franconia Sculpture Park is an innovative community arts organization that provides residence and work space to emerging and established artists. The 20-acre park, with a rotating collection of over 95 contemporary sculptures, reflects the creative talents of local, national, and international artists and is free and open to the public 365 days a year, dawn to dusk. Franconia Sculpture Park is located 45 minutes northeast of the Twin Cities at the intersection of Hwy 8 (Lake Blvd) and Hwy 95 (St. Croix Trail), three miles west of Taylors Falls in Chisago County, Minnesota.